Druid's legendary spell has been revealed, one of the last legendary spells to be revealed. The spell was revealed as part of the final Boomsday Project Livestream, ahead of the set's release next week. 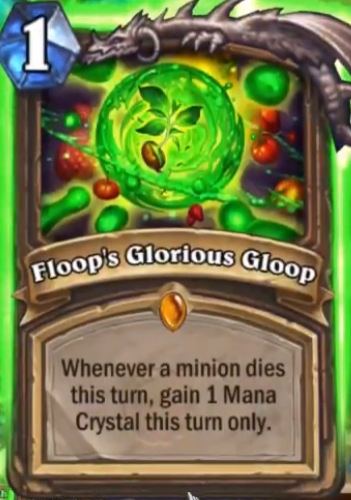 Floop's Glorious Gloop is a one mana legendary Druid spell. Whenever a minion dies this turn after playing the spell, you will gain one mana crystal. It's sort of like Innervate that can be powered up, and that's pretty scary. Innervate was one of the most powerful cards in the game until it was nerfed. This has a lot of potential in the class—a class players are already scared about.